Last week I had the pleasure of traveling to the great state of Washington. It was a fantastic experience and one which I highly recommend. As you'd imagine, there was some wine sampling done. So, what was the best wine of the trip? The answer might surprise you as much as it did me. As a preface this commentary, I'll offer two contrasting disclaimers: First, this trip was not a journalistic endeavor. Wine writing sojourns are intense with research work and grinding schedules. This was a family vacation, not an industry junket. Second, anyone who has ever gone anywhere with me knows that traveling a mile without encountering wine in some shape or form is highly unusual. In other words, though this was a trip with the family, there was plenty of wine exploration. Having applauded Washington state numerous times as a source for quality and value, I was eager to taste some of the producers' bottlings that don't make it this far east, as well as see what lies beyond the cabernet, merlot, and syrah that the region is already famous for. What I had hoped to find was a new collection of precious discoveries. What I did find was something of a disappointment. To summarize (in blunt terms), the red wines ($35 and under) were monolithic; large, dense, somewhat brutish, and generally dull. There's only so much of that a thinking person can handle. The whites were fine, just simple. There were two notable exceptions to these generalizations. Chateau Ste Michelle's Indian Wells chardonnay is very good - and can be bought just about anywhere in the country for $20 or less. Refined and full of flavor, I wish restaurant wines offered this kind of consistency and value. The other, a red, was not an insanely intense and extracted Syrah, nor was it one of the new breed of lean, green Cabernets. 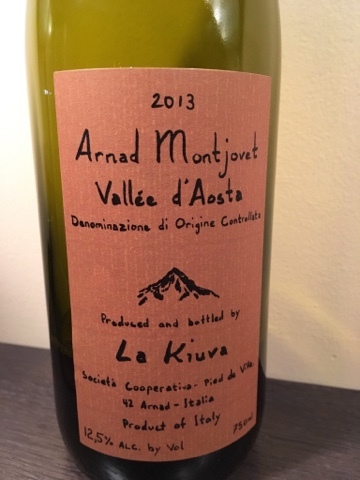 It was, a Nebbiolo from the Val d'Aosta region in northwestern Italy, made by a village cooperative of growers in the shadow of Mont Blanc. Light in body, but confident in its delivery of a kaleidoscope of bright flavors, the lip-smacking acidity made it sing with a pork ragu papardelle. An absolutely fantastic antidote to garish reds and a relative bargain at $24. Is this as much a commentary on Italian wine as it is on Washington's? Or something else entirely? There were a few experiences on this trip that suggest the latter, that our perspectives are shaped by our conditioning more than anything. Bear with me. The pleasure one derives from any experience is only measured in absolute terms the first time around. Thereafter, it's relative. And if the benchmark for an experience is set in a particular style, then that will impact the relativity of future pleasure. So, past experience is crucial to informing future. For example, living in a land-locked midwest state, the standard bearer of quality salmon is farm raised in the Faroe Islands, the benchmark gin and tonic is made with Watershed Four Peel, and Washington wine means, with some exceptions, Columbia Crest or Chateau Ste Michelle. So, it may stand to reason that the wild, line-caught Columbia River salmon we had in Seattle tasted weird, the artisanal G&T at Rosario was a flunker, and that the Robert Ramey Rhone bottlings were uninspiring. We are all a product of our own conditioning. If my palate has - for better or worse - been trained to expect the styles represented by Chateau Ste Michelle's brands when drinking Washington wine, then I'm going to experience an deviation as an aberration - and not necessarily a positive one. Still, I'm looking forward to returning for more in-depth exploration of the region soon. In the meantime, I'll be on the lookout for more of that Indian Wells chardonnay.